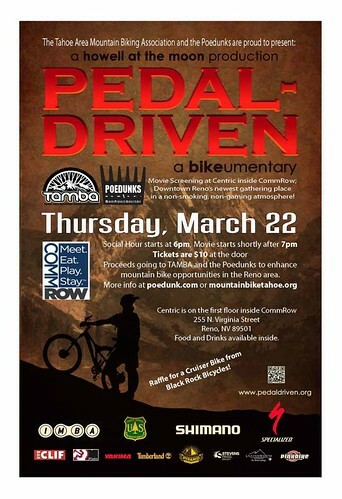 Pedal-Driven is coming to Reno on March 22. A fundraiser for the Poedunks and TAMBA, the film will be shown at Centric inside Comm Row on N. Virgina Street in Downtown Reno. Social Hour starts at 6pm, the movie will be shown shortly after 7pm. Tickets are $10 at the door. There will be $5 Raffle tickets for a cruiser bike from Black Rock Bicycles to support the construction of a pump track in Reno. Plenty of Food and Drink options available at CommRow. This is an awesome movie! I highly recommend it. It shows what a little cooperation, understanding, and patients will get.